Europe has a long history of managing coastal erosion through a variety of protection strategies, from the defences of the Venice lagoons to coastal land reclamation in the Netherlands. 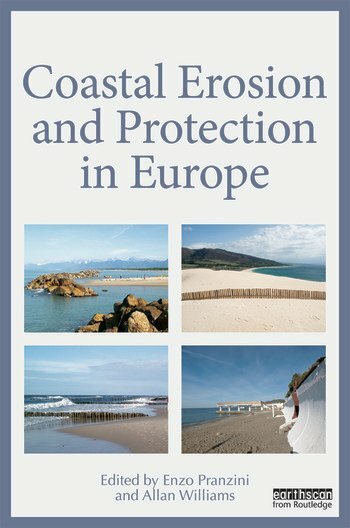 This book provides a comprehensive review of the entire coastline of Europe and a comparative analysis of erosion problems and solutions in each country. Each chapter discusses the natural and anthropogenic factors in the erosion process and in defence projects design and maintenance, including coastal morphology and wave climate, land use changes and use of coastal areas, the evolution of coastal protection, climate change and political and administrative assessments. Particular attention is paid to demographic and economic factors influencing coastal erosion in each country and to technical and administrative criteria influencing defence projects design. Lavishly illustrated in full colour throughout, the book represents a definitive reference work on its subject. 1. Introduction Enzo Pranzini and Allan T. Williams 2. Russia Ruben Kosyan, Marina Krylenko, Daria Ryabchuk and Boris Chubarenko 3. Sweden Magnus Larson and Hans Hanson 4. The Baltic States: Estonia, Latvia and Lithuania Hannes Tõnisson, Kaarel Orviku, Jānis Lapinskis, Saulius Gulbinskas and Rimas Žaromskis 5. Poland Kazimierz Furmańczyk 6. Denmark Per Sørensen 7. Germany Jürgen Jensen and Klaus Schwarzer 8. Netherlands Frank van der Meulen, Bert van der Valk and Bas Arens 9. Belgium Roger H. Charlier 10. Great Britain (GB) Simon Blott, Robert W. Duck, Michael R. Phillips, Nigel Pontee, Kenneth Pye, and Allan T. Williams 11. Ireland Andrew Cooper 12. France Edward J. Anthony and François Sabatier 13. Spain Vicente Gracia, Agustín Sánchez-Arcilla and Giorgio Anfuso 14. Portugal Óscar Ferreira and Ana Matias 15. Italy Enzo Pranzini 16. Eastern Adriatic Kristina Pikelj, Vojislav Dragnić and Nemanja Malovrazić 17. Albania Gjovalin Gruda and Merita Dollma 18. Greece George Alexandrakis, George Ghionis, Serafim E. Poulos and Nikolaos A. Kampanis 19. Bulgaria Margarita Stancheva 20. Romania Adrian Stanica, Nicolae Panin and Glicherie Caraivan 21. Ukraine Yuri N. Goryachkin 22. Conclusions Enzo Pranzini, Lilian Wetzel and Allan Williams. Enzo Pranzini is Professor of Physical Geography at the University of Florence, Italy. He is President of the Italian National Group of Environmental Coastal Research, and editor of the Italian Studi Costieri series. Allan T. Williams is Professor Emeritus at Swansea Metropolitan University, University of Wales, UK. He is author or co-author of over 300 publications, including Beach Management (Earthscan, 2009). Contributors: George Alexandrakis, Giorgio Anfuso, Edward J. Anthony, Bas Arens, Simon Blott, Glicherie Caraivan, Roger H. Charlier, Boris Chubarenko, Andrew Cooper, Merita Dollma, Vojislav Dragnic, Robert W. Duck, Óscar Ferreira, Kazimierz Furmanczyk, George Ghionis, Yuri N. Goryachkin, Vicente Gracia, Gjovalin Gruda, Saulius Gulbinskas, Hans Hanson, Jürgen Jensen, Nikolaos A. Kampanis, Ruben Kosyan, Marina Krylenko, Janis Lapinskis, Magnus Larson, Nemanja Malovrazic, Ana Matias, Frank van der Meulen, Kaarel Orviku, Nicolae Panin, Michael R. Phillips, Kristina Pikelj, Nigel Pontee, Serafim E. Poulos, Kenneth Pye, Daria Ryabchuk, François Sabatier, Agustín Sánchez-Arcilla, Klaus Schwarzer, Per Sørensen, Margarita Stancheva, Adrian Stanica, Hannes Tõnisson, Bert van der Valk, Lilian Wetzel and Rimas Žaromskis.